The fixed income world seems to have plenty of investors who love 100-year bonds. CalTech for example sold 100-year bonds this week at what feels like a ridiculously low yield of 4.74%. WSJ: [CalTech] sold $350 million of debt maturing in 100 years at a record-low yield of 4.744% Tuesday, becoming the latest institute of higher education to take advantage of low borrowing costs. Why would anyone want 100-year paper? A cynical answer is that whoever made the decision to buy such paper isn't going to be alive when the bonds mature, so it's a park-it-and-forget-it investment. But there is actually a market driven rationale for adding such investments to an institutional portfolio. 1. A number of investors have long-term liabilities, such as pensions and insurance companies. They need long duration assets to reduce their asset/liability mismatch. Clearly a 100-year bond exposes one to rising rates, but the long-term liabilities will have an offsetting effect. 2. A 100-year bond has tremendous convexity. And being long convexity is sometimes worth taking a lower yield. In fact it's equivalent to paying premium to get long gamma in options. 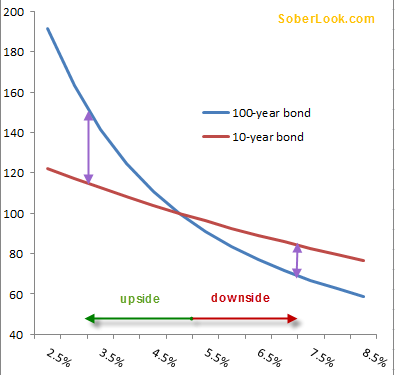 A 100-year bond will significantly outperform a 10-year bond for example if yields compress. It will underperform but to a much lesser extent if yields rise by the same amount. Convexity gives investors a cushion against rate volatility. The chart below demonstrates just how significant that effect is for a 5% coupon 100-year vs 10-year bond. Given the demand, expect more high rated corporations and universities issuing such paper. In fact the US Treasury has been exploring adding 100-year bonds to its financing arsenal. People shouldn't be surprised to see the US government issuing such bonds in the near future.